Jessica Sperandio’s “Blue Smoke” at Thompson Gallery. “Kiss the Ground — A New Armenia (Part 3),” the culmination of a series of exhibitions marking the centennial of the Armenian Genocide, delineates the aftermath of trauma. 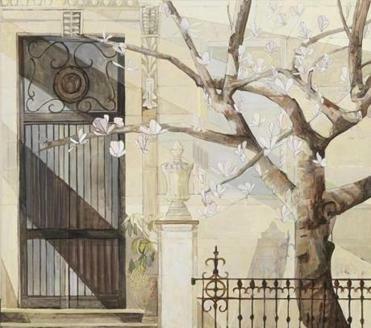 The first two (solo shows) were at the Armenian Library and Museum of America, in Watertown; this group show is at the Cambridge School of Weston’s Thompson Gallery. That’s twofold trauma: the massacre of 1.5 million Armenians by forces of the Ottoman Empire between 1915 and 1922, and the Turkish government’s continued refusal to acknowledge that a genocide occurred. The exhibition, curated by gallery director Todd Bartel, is sometimes furious, sometimes thoughtful and tender, sometimes clumsy. In all its colors, it reflects the experience of surviving trauma. Some of John Avakian’s monoprints — searing images built in part on historic photos — are almost too hard to look at. Political cartoons in an accompanying show by Lucine Kasbarian skewer Turkish officials and diplomatic responses pandering to their denial. Satire has its place, but the best works in “Kiss the Ground” are less reactive. They question and explore the impact of the genocide. Art helps us to look at pain. Ideally, it makes space to help us comprehend and integrate even the most terrible losses. 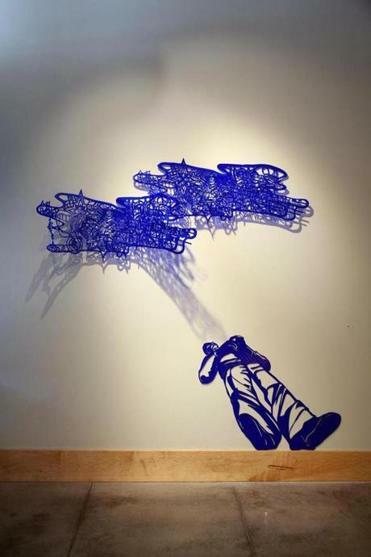 Jessica Sperandio’s “Blue Smoke,” a wall-mounted cut acrylic work, describes a supine man under a knotty, spiky cloud. A genocide survivor inspired it: He came to the United States, worked at General Electric, and suffered a terrible head injury, after which he lay on the floor all day smoking. This is his desolate haze. “Tattoo Trails I,” Adrienne Der Marderosian’s installation of prints, depicts hunched figures in long coats. She collages them with maps and cityscapes; figures repeat and disappear. They are disenfranchised; the sheer numbers make them an army of the lost. Softer works, such as Gail Boyajian’s airy, lyrical “Romantic Landscape (Triptych),” which captures ruins of an Armenian church, and Marsha Odabashian’s “Allegorical Landscape,” lushly painted on separate rods leaning against the wall, evoke absence, and the effects of time passing. In Kevork Mourad’s aching video “March 15,” a ghostly figure moves like vapor over a morphing cityscape. The figure is there yet not there; the city dissolves behind him. Mourad is a Syrian of Armenian origin, and his artist’s statement says this figure is a young Syrian. The echoes across a century and more of violence and ethnic strife in that region are harrowing. Todd Gray’s “Red Light” at Samson. 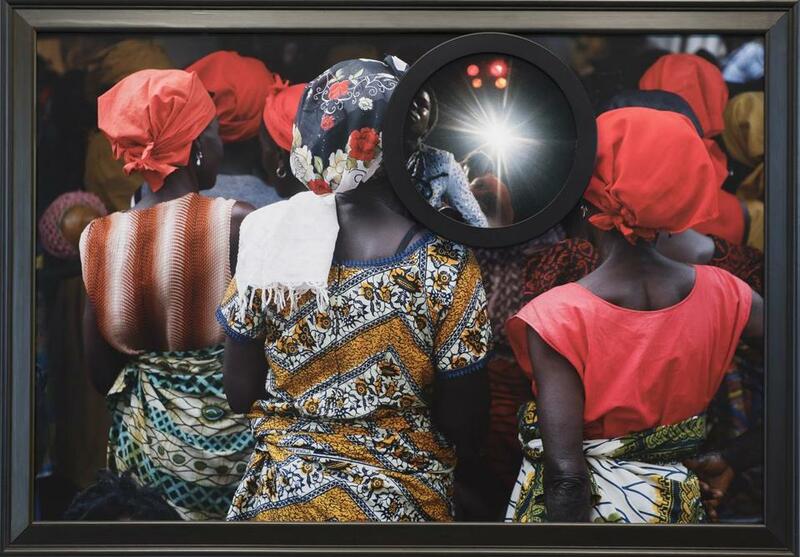 Photographer Todd Gray, in his assemblages at Samson, craftily breaks down iconography and expectations about Africans and African-Americans with canny juxtapositions. Gray was Michael Jackson’s personal photographer in the 1980s; these works mix images of Jackson and his crew with photos shot more recently in Ghana, where the artist has a studio, and images from the Hubble Telescope. “Welcome to Planet Earth” has as a backdrop an old, majestic tree, shot from below. Gray shot it in Ghana, outside a former post in the slave trade. In the center, an image of Jackson: We see the pop star from behind, as another performer pushes him forward; a light glares between them like the sun. Jackson has his hands clasped behind him, and given the context, it’s as if they were shackled and he were being offered up for sale. Did Jackson pay a terrible price for his celebrity? These assemblages telescope time and space, making potent connections. They also have formal poetry. “Akwidaa, Takoradi, Inglewood” sets an image of a Ghanaian woman in a brilliant red headscarf beside one of a Jackson brother in a cowboy hat. The cowboy hat hangs against a photo of graffiti in Ghana, which reads like a painting, and expresses anywhere-but-here aspirations of travel. Gray’s use of starry Hubble images in some of these works adds another dimension. Everyday reality bumps against extraordinary fame, and the constellations link to both — they foster dreams, yet they are all of ours to gaze upon. Aithan Shapira’s “152 Beacon Street” at Adelson Galleries Boston. Aithan Shapira’s paintings at Adelson Galleries Boston have a conservative bent — they lovingly dwell on mostly local architecture. Yet they are made with such care, with a deft hand and a smart eye, that they are never what you’d expect. Starting from scratch, Shapira mixes his pigments from earth, ash, and limestone. His diagonals of light and shadow quietly steer the course of vision. “152 Beacon Street” portrays the entrance to a house that now stands where Isabella Stewart Gardner once lived. A magnolia tree blooms in front; its pink and white blossoms flutter like oversize moths, provocatively flat against the volume of the green and dusky peach trunk and branches. Sunlight and shadow skate across the building, over the wrought iron gate of a doorway. A post or finial in the foreground casts a shadow that leans toward the tree trunk like an old chum. Every line, every shading seems deliberate and felicitous, as discerning about what beauty comprises as Mrs. Gardner herself was.